Abstraction made of the time, the geometry is preponderant. In this section, we will discuss a lot about vectors and we define the tangent, the normal and the binormal. If we take two consecutive positions, and , the average speed is the vector carried by the rope The instantaneous speed on her side is a vector tangent to the trajectory. The direction of the speed vector defined thus the tangent to the trajectory. We can get rid of the length of the speed vector and keep its direction by dividing it by its intensity. As a result, we obtain a vector of length 1 tangent to the trajectory. 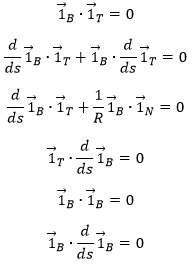 The length L of the trajectory is the sum of the lengths of the average displacements and, in the limit, to the integration of the lengths of the instantaneous displacements. The length of the trajectory s is a parameter intrinsically related to the curve ζ as it doesn’t depend upon the choice of the origin point O, nor of the parameterisation of the curve ζ. It shows, in its infinitesimal version ds, the distance to make on the tangent of the trajectory. The vector being defined, how do we express the geometric aspect related to the acceleration? By construction, the speed vector is tangent to the trajectory of the position vector. The acceleration vector is thus also tangent to the trajectory of the speed vector. How do we represent that in the space? The first term is proportional to and is thus parallel to the speed vector. The second term is necessarily perpendicular to it. Indeed, the trajectory of cannot be anywhere else than on a sphere because, by definition, its length does not change. As its derivative is tangent to this trajectory, it is thus tangent to the sphere and thus perpendicular to the radius of the sphere, i.e. to the vector . 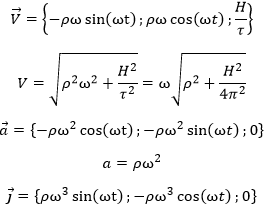 We can define the normal vector as the derivative of the tangent vector. λ is still to be determined. 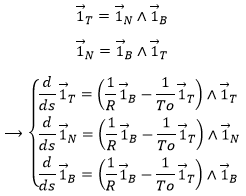 The acceleration is thus the sum of one tangent part and one normal part , perpendicular to the first part. 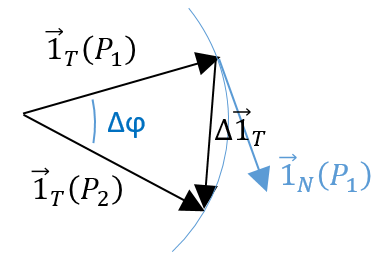 Given two consecutive positions of the point P on the trajectory ζ: and , and the direction of the speed and at the corresponding positions. The tangent unit vector , by definition, doesn’t change its length. However, its direction changes: it turns by an angle . The two tangent vectors delimitate a plane P in which is also their variation . With these three vectors, we can build an isosceles triangle and thus evaluate the length of : 2 sin( /2) and its angle with : π/2- /2. The radius R is called the curvature radius of the trajectory ζ at a given point. 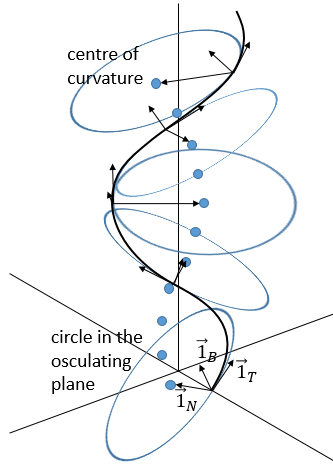 1/R is called the curvature of ζ and the limit plane P formed by the tangent vector and the normal is called the osculating plane of the trajectory ζ. What happens to the other vectors of the referential in the movement on the trajectory? 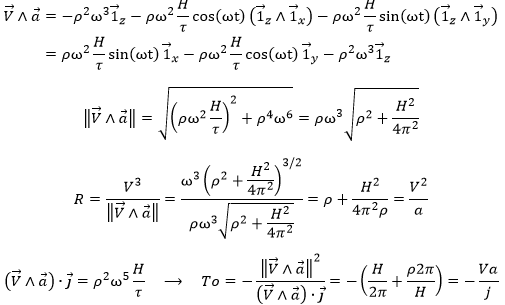 As the vectors are orthonormal to each other, we can determine them from scalar products. Remember that to define the vector we chose R positive; to define the vector , we used the two vectors and . As a result, we don’t have the choice for the sign of To, that can be positive or negative. We can use the fact that the vectors are the scalar product of each other. The osculating plane is the one we chose, obviously. The torsion 1/To equals zero because the trajectory is in the plane z=0. The acceleration is proportional to the radius of the circle (at a fixed ω) but inversely proportional to it at fixed V.
The torsion and the curvature are thus constant during the movement. The following figure shows an example where the three Frenet vectors, the position of the centre of curvature C and a few circles of centre C and of radius R in the osculating plane P.
We can visualise the torsion by the rotation of the osculating plane. 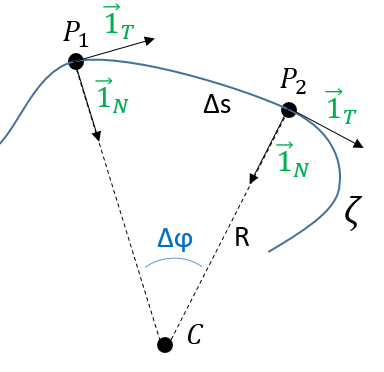 The normal vector is the one pointing towards the centre of the curvature, the tangent vector is the one tangent to the trajectory and the vector product of these two vectors gives the binormal vector, perpendicular to the circule tangent to the trajectory.